He didn't have many tall post players, but he did have a lot of quick guards who could get to the rim. Coach Walberg originally name this offense 'Attack, Attack, Skip, Attack, Attack'. Who Should Run the Dribble Drive Offense? The dribble drive motion is a great offense for all ages and skill levels. It's best utilized by teams who have aggressive and capable ball-handlers who can attack their opponents in one-on-one situations and get to the rim and finish. If possible, teams should also have several players who have the ability to knock down open three-point shots. This will make it difficult for defenders to help on drives and will punish them if they choose to. Finally, this offense is hard to run without players who have a high basketball IQ. While this offense definitely develops it, players must be able to make smart decisions on whether to shoot or pass. Players Make Decisions - Players have a lot of freedom to make decisions when running the dribble drive offense as their are no strict offensive guidelines. Creates High Percentage Shots - Teams who implement this offense will get a lot of layups and open three-pointers if run correctly. These are both great shots that lead to a high points per possession average. Draws Fouls - With players consistently attacking the rim, there are a lot of opportunities for players to draw fouls. This leads to more free-throw opportunities and puts the opposition in foul trouble. Positionless Offense - Although there is a post player inside, any player on the team can fill any of the five positions on the floor. Post Space - If you do choose to take advantage of a mismatch inside, there is a lot of space inside the key with the other four players spread out around the three-point line. Tendency to Over Dribble - Since the dribble drive motion offense relies on dribble penetration, it's possible that some players will elect to dribble immediately when there are better options like passing to a teammate. Can Lead to More Turnovers - Attacking the paint and then kicking out to a teammate behind the three-point line is a difficult pass to make. This can lead to more turnovers than a more 'perimeter passing' offense like the 5-out motion. 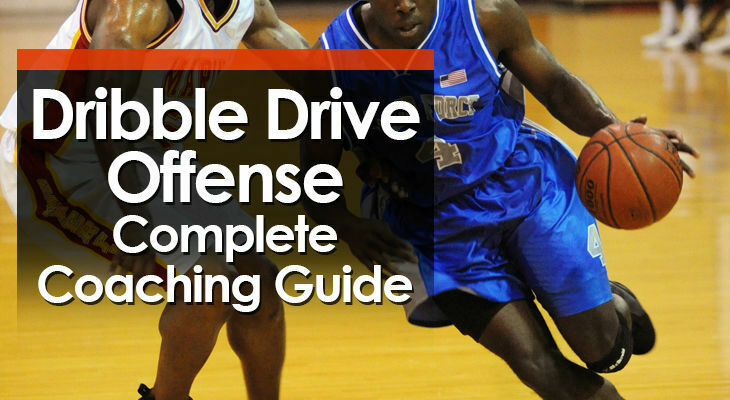 Lack of Offensive Guidelines - The dribble drive offense can be difficult for players who are used to being told exactly what to do and exactly when to do it (set plays do this). Lack of Screens - On-ball and off-ball screens are one of the best ways to create an advantage for the offensive team. These actions aren't common in the dribble drive offense. Tendency to 'Ball-Watch' - Most young players are used to standing and watching when a teammate attacks the rim. In this offense, they must learn to move to open space on dribble penetration. Spacing is Difficult - With all the dribble penetration, players can find it difficult to read their teammates and keep even spacing around the perimeter. Settling for Three-Pointers - Another disadvantage I've found when running the dribble drive motion is players settling for three-pointers when they have even a half-second of time. Have to attack if you're not making outside shots. 1. Always be in 'Attack Mode' - This mentality is crucial for effectively running this offense. On every catch, players should be looking to attack their on-ball defender and get to the hoop or create for a teammate. 2. Post Player Always Weakside - In this version of the dribble drive offense, the post player should continually move to the weakside depending on the location of the basketball. Unless they have a clear advantage and the coach wants an isolation. 3. Spacing is a Top Priority - Players should always be thinking about if they're spacing the floor correctly. Apart from the post player and driver, players should always stay behind the three-point line. 4. Don't Hold the Basketball - If you can't attack your defender and get to the rim, move the basketball. We want to keep the defense moving so that holes open up and the defense is forced into closeouts. 5. Don't Pass and Stand - After passing, players must cut or move so that the defense is forced to stay locked in. This will prevent them from playing effective help defense. The Dribble Drive Motion Offense starts in a 4-out 1-in setup. • Two players in the slots at the top of the key (1 and 4). • Two players in the corners (2 and 3). • One post player in the weak-side short corner (5). It's important to note that all of these positions are interchangeable. Don't be afraid to insert a guard into the post area if they have a mismatch on the inside and they aren't a great three-point shooter. We're going to avoid all the fancy terminology and keep things as simple and effective as possible. The first thing teams must look for in the dribble drive offense is dribble penetration from either 1 or 4 from the slot positions at the top of the key. The first option to look for is a rim-attack from the player who advanced the basketball up the court. If they have a mismatch, take advantage of it and get to the hoop. When this happens, 1 should first be looking to score with a layup or pass to 5 for a layup if their defender rotates to help. If neither of these options are open, 1 looks to pass out to the perimeter to 2 or 3 as they slide up from the corner. These players may be open for a three-point shot or can then attack their defender who must close out. If none of these options are open, 1 can reverse pivot and pass out to 4 who has filled cut across to fill their original slot position as a pressure release. On this pass, 1 will clear out to the weak-side corner as 3 moves up to the slot position. If the point guard doesn't believe they have an advantage attacking their on-ball defender, they can choose to make a slot-to-slot pass to 4 and then cut through the key to the strong-side corner. When this happens, 2 cuts from the corner to the weakside slot position to create space in the corner for 1 to fill. Upon receiving the first pass, 4 must look to immediately attack the rim on the back of the point guard's cut which will catch the defense rotating. On this dribble penetration, the same rotations apply as in option A. If there are no opportunities to attack from the top of the key, the players in the corner cut to the wing to receive the basketball. The player in the ball-side slot passes the basketball to the wing and then cuts through to the strongside corner. If a player on the wing attacks towards the middle of the key, the first thing they should be looking to do is score or pass to 5 for an open layup when their defender helps. If none of those options are open, the perimeter players must be moving around the three-point line to create passing lanes. 1 will slide in behind the space left of the wing while the players in the 3 and 4 positions look to create space for a kick out. On a baseline drive, 5 must immediately step to the middle of the key to create a good passing angle if their defender chooses to provide help. 3 slides to the corner while 1 and 4 must move to create a passing angle if the player with the basketball decides to pass out towards the top of the key. The dribble drive motion offense setup also provides great spacing to take advantage of several isolation opportunities both inside and outside. My recommendation is to have specific play calls for each of these options as how they are set up varies slightly from the base offense. These a great to call out of timeouts after you've identified a mismatch. Off this play call, 2 cuts to the wing and receives the pass from 1. The post player with a mismatch (5 in this scenario) will cut across to the ball-side and battle for front position on the low block. 2 feeds the post and then cuts through to the opposite corner as all the perimeter players fill around to keep their defenders moving. This makes it difficult for the defense to double the low post. 2 cuts to the wing from the corner and receives the pass from the point guard. 1 then cuts through to the weakside corner as all perimeter players fill around. This leaves 2 in a isolation with a lot of space to work with left and right. If you're looking for high-quality shots, the dribble drive motion could be perfect for you. I've watched many dribble drive teams (especially at the youth level) relentlessly attack the rim which has led to success on the scoreboard and putting the opposition in foul trouble. But if your goal is take high-percentage shots and you have players who can finish strong inside and shoot from long distance, then this will give your team a high scoring offense.